Remember when you dissected frogs in eighth grade science class? Even though it grossed you out a little, you stared in amazement and all the tiny, perfectly formed organs. You'd seen frogs for your whole life, but you never realized how intricate and interesting something as simple as a common backyard amphibian could be. Well, that, or you just gagged your way through the smell of formaldehyde so as to not fail the assignment. 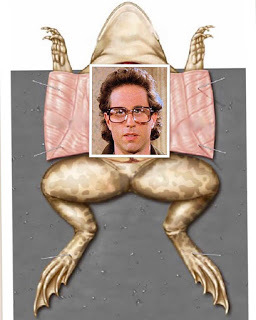 So, what do frogs have to do with Seinfeld Minute? A lot, actually. You know Seinfeld. You love Seinfeld (and if you love it as much as we do, kudos to you for being our level of insane). But if you've ever wished in vain that you could watch it again with fresh eyes (after all, you've gotta go in fresh! ), you're about to be treated to just that. Join us as we bring you your favorite episodes in a way that'll leave you feeling Seinfeld satisfied in a way you haven't been since the first time you watched "The Non Fat Yogurt." Or "The Cigar Store Indian." Or "The Cheever Letters." We're going to dissect each episode minute by minute. Think of Seinfeld Minute as the microscope that shows you the sea of life that exists in every drop of water. Get ready for Seinfeld as you've never seen (or heard) it before. We promise we won't ever yada yada over the best part.